Dr. Thomas Lintner itemizes the total cost of liposuction, enabling his potential patients to understand exactly what they are paying for and make informed decisions about their health. 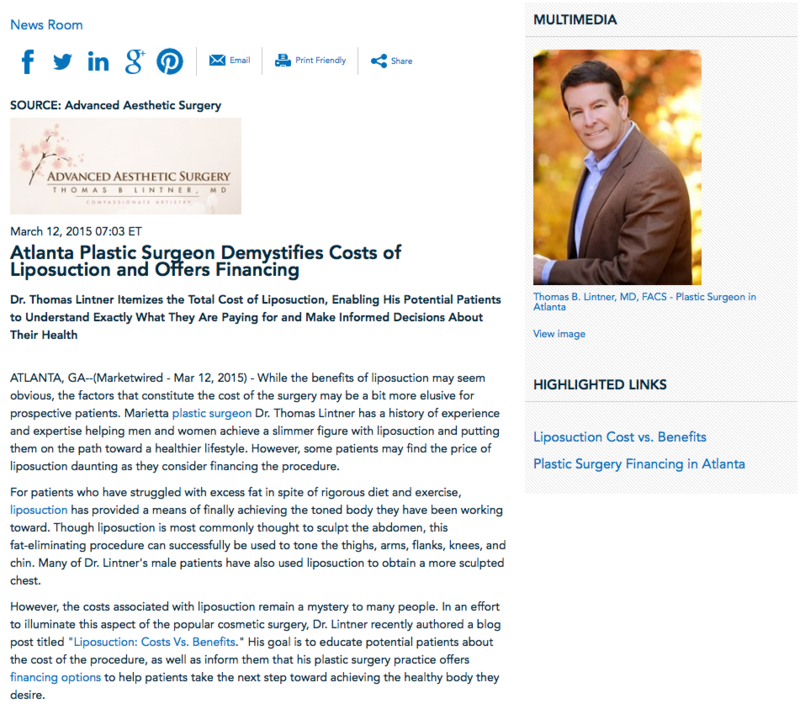 Atlanta, GA – While the benefits of liposuction may seem obvious, the factors that constitute the cost of the surgery may be a bit more elusive for prospective patients. Marietta plastic surgeon Dr. Thomas Lintner has a history of experience and expertise helping men and women achieve a slimmer figure with liposuction and putting them on the path toward a healthier lifestyle. However, some patients may find the price of liposuction daunting as they consider financing the procedure. For patients who have struggled with excess fat in spite of rigorous diet and exercise, liposuction has provided a means of finally achieving the toned body they have been working toward. Though liposuction is most commonly thought to sculpt the abdomen, this fat-eliminating procedure can successfully be used to tone the thighs, arms, flanks, knees, and chin. Many of Dr. Lintner’s male patients have also used liposuction to obtain a more sculpted chest. However, the costs associated with liposuction remain a mystery to many people. In an effort to illuminate this aspect of the popular cosmetic surgery, Dr. Lintner recently authored a blog post titled “Liposuction: Costs Vs. Benefits.” His goal is to educate potential patients about the cost of the procedure, as well as inform them that his plastic surgery practice offers financing options to help patients take the next step toward achieving the healthy body they desire. First, Dr. Lintner breaks down the total cost of liposuction into all of its components: the pre-operative testing, hospital facilities, anesthesia team, post-operative medication and garments, as well as the surgeon have individual fees. Perhaps more importantly, Dr. Lintner asks patients to consider the qualifications of their surgeon and look beyond their surgical fee. “When deciding upon a surgeon for [liposuction], keep in mind that while a less experienced surgeon may seem the cheaper option, a more experienced board-certified plastic surgeon can not only provide you with superior final results, but also reduce the risks of costly complications.” Ultimately, a more experienced plastic surgeon may cost more money up front but save you time and money in the long run, while also optimizing the cosmetic outcome. Dr. Lintner has seen liposuction greatly improve the lives of his Atlanta plastic surgery patients and hopes to enable more people to make well-informed decisions about their body, health, and lifestyle.